When I lived up north, it was right on the Minnesota-Wisconsin border. I didn’t venture into Wisconsin that often, momentous trips like picking up my dog aside. Most of the time, trips across the border occurred in those crucial years of my mid-teens and early 20’s. My friends and I would venture over the bridge because the Badger State’s bars were open later. I guess what I’m saying is that while Wisconsin was a mysterious netherworld to even the people who lived next door to it, it was worth the trip if you were a budding alcoholic. Maybe one of the sore spots would be how the police used to love stopping anyone who had Minnesota plates on their car. Even at our most careful, we would get stopped on multiple occasions. I guess that was enough to give us some negative feelings towards the state, whether it deserved them or not. Not too far from where I lived, there was a store I never dared to visit. We passed it on the road multiple times and it spoke volumes about what might lie inside. You may have actually seen pictures of it, since the storefront was featured in various Weird World type books. The store specialized in two things, prominently advertised – Cheese and Taxidermy. Bringing this store up seems apropos of the film I’m discussing. That combination of the cheesy combined with morbid creepiness pervades every crevice of HOLE IN THE WALL. 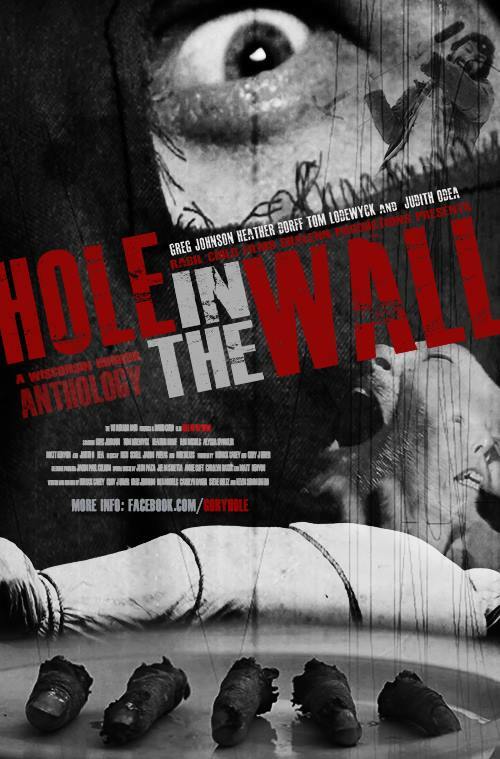 HOLE IN THE WALL is an anthology horror film that proudly wears its Wisconsin heritage on its sleeve. It then wastes no time in plunging you headfirst into some of the most sickening, unsettling and altogether odd sights it can come up with. This is a film that will probably disgust, repel and offend everyone in its audience, and that’s just within the first twenty minutes. Right away, we are treated to the image of an unkempt burly man (Greg Johnson) dragging a body through a field and into a rural home. The Plainfield Chopper has claimed his latest victim and now he notices that he has gained an admirer. A farm boy (Draven Wagner) is spying on the Chopper at work, but rather than be upset, the farm boy is informed that he was expected. We go back and forth to this story throughout the film in what ends up being the closest thing we have to a wraparound. Eventually, we will also see the origins of the Plainfield Chopper, if not the madness that drives him. These segments are directed by Derrick Carey. HOLE IN THE WALL is an anthology film, but it doesn’t have the typical, “Let me tell you a story” structure (unless you count Andrew Shearer’s channeling of Criswell in a pre-credits intro). In a refreshing twist, it instead gives us glimpses of the macabre and bizarre with the one story serving as a canopy. The stories aren’t unified in their telling. However, all of them seem to be linked not just in their Midwestern roots, but in that they all seem to dwell on continuous cycles of abuse and violence that keep spinning into further depravity. Similar dramatic segments involve bits like Carolyn Baker’s haunting and poetic “Siren.” This is one of the film’s rare urban excursions and one can almost get lost in its savage beauty. Carrey’s previously mentioned origin story, “Our Song Is My Blade” touches on similar themes, and offers a surprisingly beautiful if disturbing take on the backwoods killer trope. There is humor as well, thank God. But even these aren’t your typical slapstick. Corey Udler’s “Ed Gein DDS” involves a trio of witches bringing Wisconsin’s most infamous boogeyman back to life. It’s silly and wacky but even it involves a strong and believable female lead (Heather Dorff). Likewise, Greg Johnson’s “Last Dance” tries to push some buttons with it’s grotesque imagery and it’s portrait of the American family from hell. And yet, it’s tempered with a certain sadness of something beautiful being destroyed by years of spirit-crushing misery. I’m not saying the clowns made me cry, but they hit me in the chest pretty good. Oh yeah, and there’s a post-credits sequence too. But that’s all I’ll say. Best to let you find that nugget of goodness for yourself. HOLE IN THE WALL involves several figures who all heed a siren song that leads to their deliverance and destruction. The film is a tapestry of pain. It’s wild and bizarre and a good time. But it’s also a film that grabs you by the hair of your head and forces you to look deep down into the gutter of human depravity. The sound design throughout, far better than most SOV productions, creates a unifying feeling that you’re looking at a piece of Americana from your box seats in Hell. But even though I’m stressing some of the shocking sights HOLE IN THE WALL has to offer, it would wrong not to point out how oddly beautiful a lot of it is. HOLE IN THE WALL announces to the world that there is a lot of creative and unsettling horror coming out of Wisconsin. And it’s creepy enough to make me glad I mostly stayed in Minnesota. Recommended. HOLE IN THE WALL is currently available On Demand at Vimeo and IndieReign.